The Vertool ® Force drive is a gear driven dual action polisher that offers the safety of a dual action polisher with the cut of a rotary. 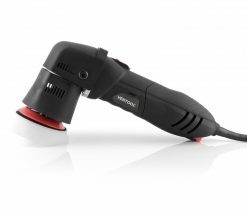 Unlike regular dual action polishers, with the Vertool® Force Drive, the actual random oscillations are driven by the motor which means the polisher never slows or bogs down on curves and under load like traditional dual action polishers. 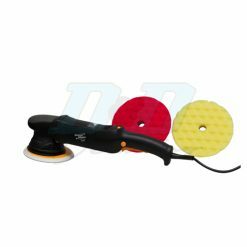 However at the same time it retains all the safety and usability benefits of a dual action polisher. The lower rotational rate means that heat isn’t generated as quick and that there is far less chance of generating holograms as part of the finishing process. Importantly the polisher is supplied with two backing plates, both a 5″ (125mm) & 6″ (150mm) allowing far greater flexibility and pad choice as well as a high quality canvas carry case. Supplied with a D-Handle, Spare Set of Brushes & Allen Key, Canvas Carry Case.